Handmade plush toys for the young at heart! My current processing time on all orders is 1-2 weeks. Thank you for your patience. Each product is hand-stitched and one-of-a-kind. I welcome custom orders so please don't hesitate to contact me with any ideas you might have! Take a look, laugh, smile, and enjoy! All of the felt used in Cutesy products is eco-friendly and made 100% from recycled consumer plastic bottles!!! Well made and sturdy, not to mention absolutely adorable with that wild edge that I greatly appreciate. The birth of a monster maker. Diane Koss is the owner, designer, and creator behind the one woman army of plush monsters that is Cutesy but not Cutesy. With a burning need to make use of her idle hands, her love of all things fuzzy, and her mild obsession with antlers, the first monster was born in 2007. Inspired by her grandparents’ stories of stitching by hand, she holds true to tradition and stitches each one with just a needle and thread without the use of any machines. Diane has been hand-stitching hundreds of one-of-a kind monsters to send off on small (and large) adventures of their own ever since. When not burning the midnight oil in the monster warehouse (her two bedroom apartment) just outside of Philadelphia, Diane can be found traveling the country with her monster army close behind to various craft shows and galleries. 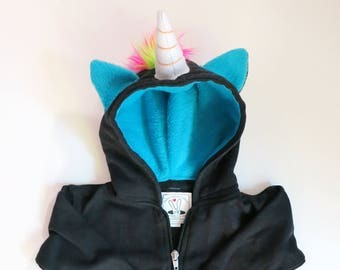 She’s since expanded her line to include monster hoodies, t-shirts, baby onesies, dishware, and more. I'm the owner and designer behind the one woman army of plush monsters that is Cutesy but not Cutesy. With a burning need to make use of my idle hands, my love of all things fuzzy, and my mild obsession with antlers, the first monster was born.